The longest-serving member of the US Congress says he is stepping aside as top Democrat on the House Judiciary Committee while sexual harassment allegations are investigated. 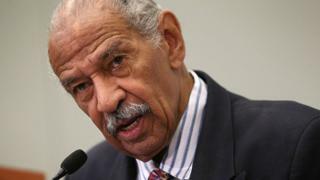 John Conyers again denied the accusations, but said he was stepping down to clear his name. A prominent civil rights leader, Mr Conyers first joined Congress in 1965. On Sunday, Mr Conyers, who is 88, tweeted that he would like to remain as ranking member on the judiciary committee, but that he could not "in good conscience" allow the charges to "undermine" House colleagues. Mr Conyers said that many of the allegations "were raised by documents reportedly paid for by a partisan alt-right blogger". The files have not been independently verified by BBC News. The leader of the Democrats in the House of Representatives, Nancy Pelosi, said it was imperative that Mr Conyers received "due process". Ms Pelosi called him "an icon" who had advanced women's causes. However she tweeted, in reference to Mr Conyers: "Zero tolerance means consequences... No matter how great an individual's legacy, it is not a license for harassment." Mr Conyers is the last member of Congress to have been in office under President Lyndon Johnson in the 1960s.